Steam the broccoli for about 25 minutes. I do this the old way, using a simple steaming pot and i put a half cube of stock in the boiling water, it makes the steamed vegetables more tasteful. If you like your vegetables crispy, then make sure not to overcook them at this stage since they still have to go in the oven for a short while. When the broccoli is ready, take them out of the steamer and let cool them down in an oven dish. This recipe is ideal as a side dish when you have guests, since you can prepare it and just shove it in the oven when you need to serve. Pre heat the oven at 180°C. 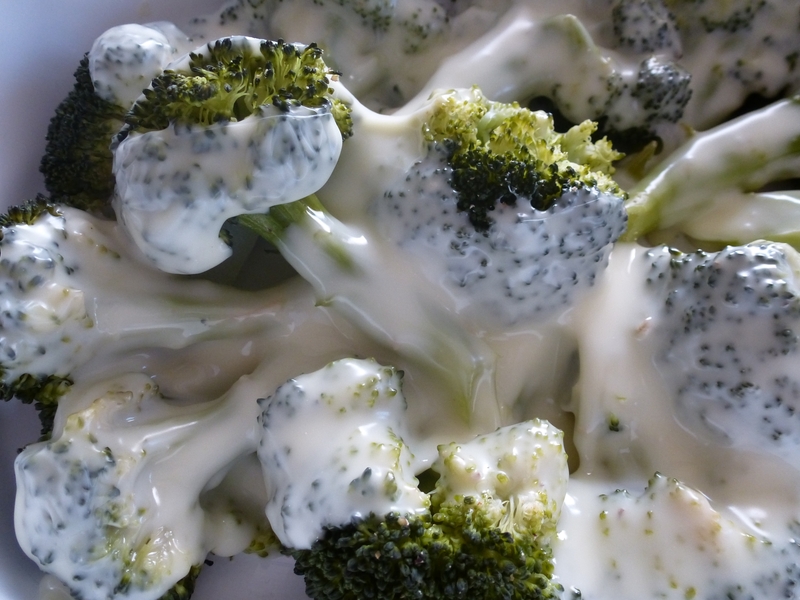 Add some salt and pepper and cover the broccoli with slices of the cheese. I use the light cheese to have maximum taste with minimum calories. Of course you can experiment with even more tasteful and less calorie friendly regular cheeses like Cheddar or Gouda. Put the dish into the oven for about 10-15 minutes. It is best to keep an eye on it, you want the broccoli warm, but the cheese still visible as a layer covering the broccoli. When you leave it all in the oven to long, the cheese will have melted completely and have sunk between the broccolis. It may taste the same; it is definitely not as good looking. Important is to let the broccoli cool down before you add the cheese on top of it. 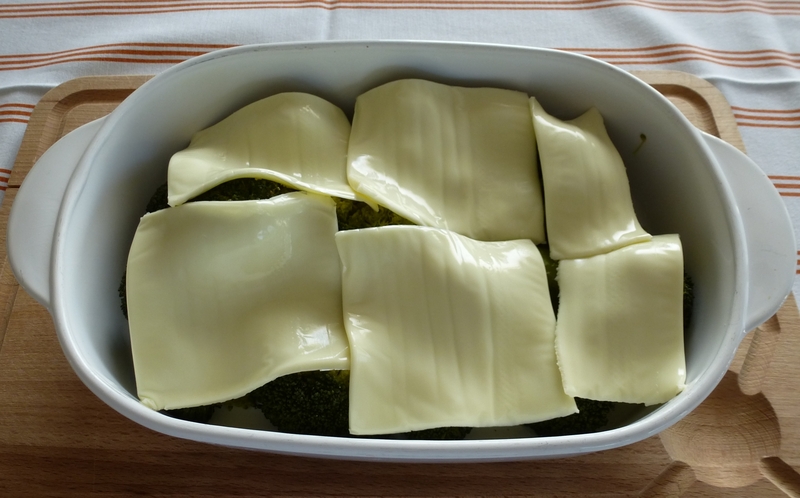 If you put the cheese when the broccoli is still warm, it will be melted before you can put the broccoli into the oven. This recipe developed out of the leanness of the fridge during one of my ‘poor’ weeks… the very odd week when I do make an effort to cut some calories. It’s so simple, yet so good!